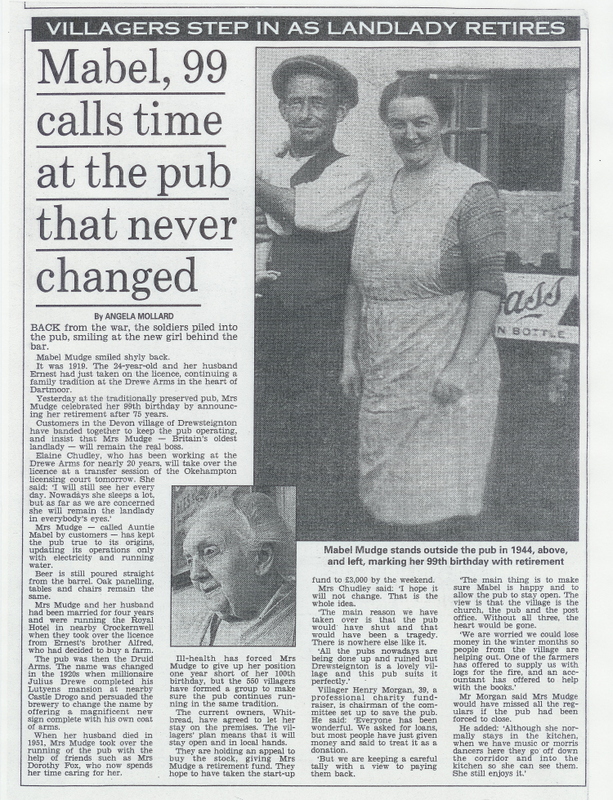 This piece was reported in the Herald & Express in 1994 when Mabel retired. From left to right, Ernest, Mabel, with baby Edwin, Alice and her mother Elizabeth. Alice Yeo , daughter of John Yeo and Elizabeth Crout married Edwin Ellis , in 1890 in Dunsford Area. Alice was born in 1870 in Holcombe Burnell. . One of the children from this marriage was Mabel Ellis who married Alfred Mudge . This very special photograph hung in the Drewe Arms, Drewsteignton for many years. It must have been taken in 1929 as it includes little Ernest, the baby Mabel & Alfred lost. Also in the photograph are Alfred and Mabel, her mother Alice and grandmother, Elizabeth Yeo nee Crout. When Aunt Mabel eventually had to go into a nursing home her friend and employee, Elaine Chudley sent me the photograph which I quickly photocopied and then returned so no-one was aware it was missing. Elizabeth must have died soon after this photograph was taken. Mabel married Ernest Mudge , son of William Mudge and Charlotte Ball . Aunt Mabel, as she is remembered was by the time she retired at the age of 99 years in 1994, the longest serving landlady in England. Mabel & Ernest became landlords of the Drewe Arms in Drewsteignton in 1919 taking over from Ernest's oldest brother Alfred. Ernest was the youngest son of William Mudge and Charlotte nee Ball. William & Charlotte had six children, William Henry , Alfred, who became landlord of the Druid Arms, as it then was, in 1893, Albert who was the landlord of the Royal Hotel, Crockenwell, until 1916, Jessie who married Jack Ashplant and started the Tea Shelter at Fingle Bridge, Bessie who married Benjamin Hill and Ernest . When Ernest died in 1951, Mabel continued as the landlady and when she retired in 1994 the villagers joined together to run the pub until she died. The Drewe Arms, as it was named in the 1920's when Julius Drewe completed his mansion of Castle Drogo and persuaded the brewery to change the name. Mabel retained all the original charm of the pub and even now as a token of the affection everyone had for her the new owners have kept much of this. She was a real celebrity and even had a television programme made of her life at the Drewe Arms. Sadly she lost her only child at the age of 5 months.The child from this marriage was Ernest Edwin Mudge born in May 1929 in Drewsteignton, Devon and died on 1 Oct 1929 in Drewsteignton, Devon. In 1992 I visited her to ask questions about the family and whilst she was then deaf her memory was brilliant. She remembered all the family right down through the generations and gave me so much information that was later to prove correct. This postcard of the Drewe Arms was sent to her cousin Charles Yeo in the 1920's and was from Harry and Nance, possibly nephew Harry Yeo married to Alice Lee?. All the family seem to have visited Drewsteignton at some time in the life to meet this amazing woman and in fact Charles can remember being taken there as a young boy and I remember visiting her in the early 1960s.. Aunt Mabel had a large bed in the downstairs room on the far right and after Ernest died and up until she left the Drewe Arms she lived there alone. It would have been so easy for someone to have broken in to the place which was full of antiques, but she showed no fear. Her friends and employees looked after her by day but she insisted they went home at night. Recently I visited the Drewe Arms and was amazed how much of it still remained as a memory to Aunt Mabel. There were old photographs adorning all the walls. Hwever the cuisine was rather different from Aunt Mabel's traditional Cheese & Home Cooked Ham Ploughmans ! !